Background: Complementary and alternative medicine (CAM) is defined as a group of various medical and healthcare systems, practices, and products that are not generally considered part of conventional western medicine. Objective: This study was carried out to estimate the prevalence of CAM use among diabetic patients and to assess knowledge, attitudes, and practice of CAM among diabetic patients. Materials and Methods: This is a hospital-based cross-sectional study done at diabetic center of Merjan teaching hospital on 200 patients. Results: This study estimated that the prevalence of CAM use among diabetic patients at Babylon province was 48.5%; the most common type of CAM used by diabetic patients was Herbal products (24.7%), while nutritional supplements and spiritual healing together used by (18.6%)of (CAM) users, herbal products and nutritional supplements together at rate of (14.4%) and (40.2%) use the 3 types of CAM modalities together. The most common type of Herbal products used by diabetic patients were Garlic which used at (16.9%), while Lemon used by (19.1%) of Diabetic patients, Cinnamon (Darcin) (10.2%), Fenugreek (Helba) (8.8%), (7.3%) bitter gum, and (18.3%) were a mixture of herbs, (7.3%) black seed. (62%)of Subjects had good knowledge about (CAM),(28%) had fair knowledge and (10%) poor knowledge. (66%) of (CAM )users had negative attitudes toward (CAM) and (34%) had positive attitude. Conclusion: Our study estimated the prevalence of CAM use among diabetic patients, revealed good knowledge of the diabetic patients and negative attitudes of CAM users, and showed five significant associations with score of knowledge and attitudes (age, educational level, residence, family history of DM, and follow-up visits), which was consistent with some studies in other eastern and western countries. Complementary and alternative medicine (CAM) is “defined” as a group of various medical and healthcare systems, practices, and products that are not generally considered part of conventional Western medicine. The World Health Organization defines traditional medicine as “the sum total of the knowledge, skills, and practices based on the theories, beliefs, and experiences indigenous to different cultures, whether explicable or not, used in the maintenance of health as well as in the prevention, diagnosis, improvement or treatment of physical and mental illness. Traditional medicine practices vary greatly from country to country and region to region, as they are influenced by factors such as culture, history, personal attitudes, and philosophy. “Traditional practices are based on a holistic approach to the human being within the wider environment; it is a framework that reaches far beyond the field of health to the broader level of society, religion, and culture.” CAM can be classified into five categories: (1) biological-based therapies like herbal and dietary supplement, (2) alternative medical systems like acupuncture or Ayurveda, (3) energy therapies like Reiki, (4) manipulative and body-based systems like chiropractic or massage, (5) Mind–body interventions like tai chi or yoga. Diabetes mellitus (DM) is defined as a group of metabolic disorders which include a high blood sugar for long period. Symptoms of high blood sugar demonstrated as frequent urination increased thirst and increased hunger. This condition if left untreated can cause multiple complications. DM included type 1 DM, type 2, DM, gestational DM, maturity-onset diabetes of the young, and other types. The occurrence of CAM use among diabetic people widely variable in the world. This is depending on the definition of the “CAM” and the different study design used by researchers. The prevalence of CAM use ranged from 17% in the UK to 72.8% in the USA with an average of 45.5% of participants in the studies reporting the use of some form of CAM. Although evidence is increasing in support of the use of various CAM to treat a wide variety of complications of diabetes mellitus. Many developed nations and some developing populations reported the incidence of CAM use among people with or without DM range between 17% and 72.8%. The most common types of “CAM” usage were nutritional supplements, herbal medicines, spiritual healing, naturopathy, manipulative body-based therapy, energy therapy, and relaxation techniques. A study conducted in Al-Nasseriya in the south of Iraq reported that the prevalence of use of herbal remedies in the last year was 17.3%. The most commonly used type was a mixture of herbs made by local herbalists (17%). Of the participants, 39.9% reported that they used more than one herb at the same time. There are several causes that made the patients with diabetes to use numerous types of CAM practices to regulate their blood sugar in the Eastern and Western worlds; some of these causes include lower cost, safety, fewer side effects, better control of treatment policy, the infectivity of modern medications in treating chronic illnesses, health promotion and well-being and difficulty of reaching the physicians in hospitals. The increased use of CAM habits has been associated with the increased incidence of chronic disease, especially DM, which is considered to be a global public health problem associated with significant morbidity and mortality and a huge burden on public health systems. The aim of this study was to explore the knowledge, attitudes, and practice of CAM use among diabetic patients for the estimation of the prevalence of CAM use among diabetic patients and finally to discover common types of “CAM” practices among those patients. 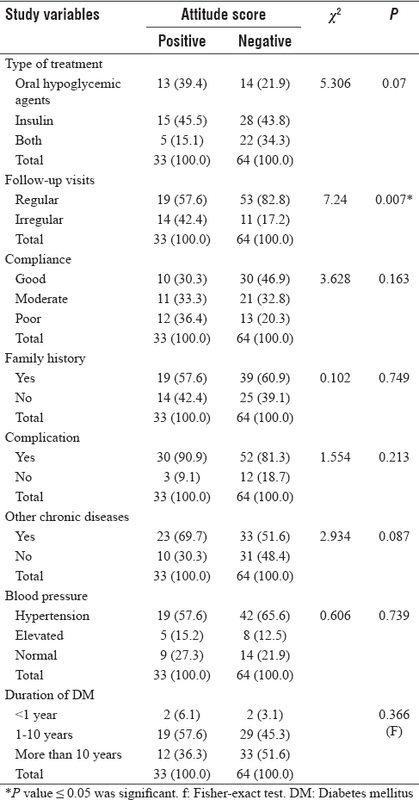 This hospital-based cross-sectional study was designed to explore (200) Iraqi diabetic patients who visited Diabetic center of Merjan teaching hospital, Babylon province, Iraq. The study period extended from the first of March to the first of June 2018. Criteria for inclusion of patients in the study included age (18 years and above), diagnosis of DM, and ability to give informed consent to participate in the study while exclusion criteria included age below 18 years, pregnant woman to exclude gestational DM, patients with intellectual disabilities, and patients with chronic debilitated illnesses such as cerebrovascular accidents and renal failure. Study protocol was approved by ethical committee in Babylon medical college, Babylon University. Official agreement was obtained from Babylon Health Directorate. Patients' verbal consents were obtained before interviewing after explaining the objectives of the study. Data were kept confidentially; names of the participants are replaced with identification codes. This is a cross-sectional study conducted at the diabetic center of Merjan teaching hospital. This is a tertiary care center which provides services (health promotional, preventive, curative, and rehabilitation) for diabetic patients for controlling their symptoms as well as diagnosis and follow-up of related comorbidities such as high blood pressure, obesity, metabolic syndrome, and eye diseases. The diabetic patients who visited this center for the first time or for follow-up during the time of data collection were asked to participate in the study after explaining the subject of this study; their verbal approval was obtained; then, when they agreed, they were interviewed. Data of 200 diabetic patients were analyzed using Statistical Package for the Social Sciences version 20 (SPSS, IBM Company, Chicago, USA). Categorical variables were presented as frequencies and percentage. Continuous variables were presented as mean ± standard deviation. Pearson's Chi-square test and Fisher exact test were used to find association between the categorical variables. Independent samples t-test was used to compare means between two groups. ANOVA was used to compare means between three groups or more. P ≤ 0.05 was considered as statistically significant. 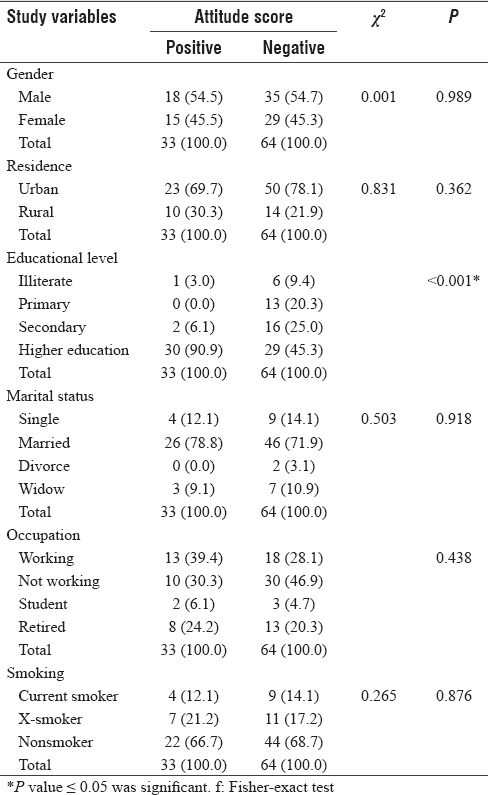 [Table 1] shows the association between knowledge score and sociodemographic characteristics including gender, residence, educational level, marital status, occupation, and smoking history among diabetic patients. 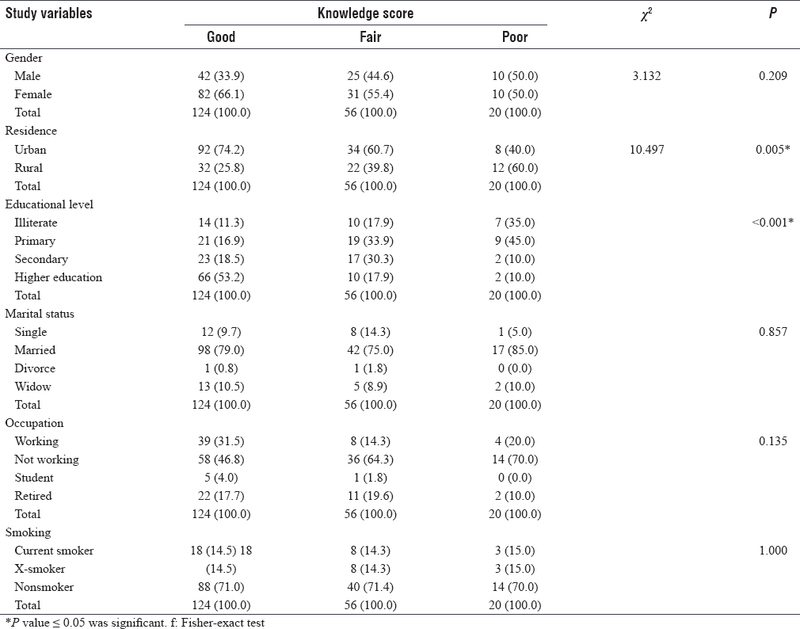 Regarding the association between knowledge score and study variables among diabetic patients, [Table 2] shows association between knowledge score and study variables including type of treatment, follow-up visits, compliance, family history of DM, complication, and duration of DM among diabetic patients. Regarding the association between attitude score and sociodemographic characteristics among diabetic patients, [Table 3] shows association between attitude score and sociodemographic characteristics including gender, residence, educational level, marital status, occupation, and smoking history among diabetic patients. 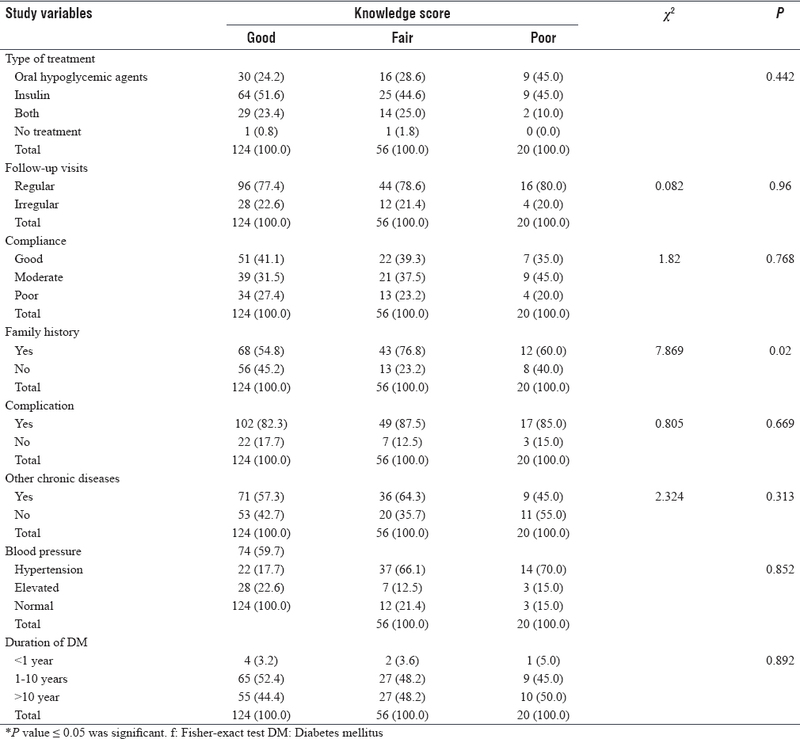 Regarding the association between attitude score and study variables among diabetic patients, [Table 4] shows association between attitude score and study variables including type of treatment, follow-up visits, compliance, family history of DM, complication, and duration of DM among diabetic patients. Regarding distribution of diabetic patients according to their score regarding knowledge CAM, results showed that 62% of diabetic patients presented with good knowledge about CAM. Regarding the distribution of diabetic patients according to use CAM, results found that 97 patients (48.5%) of diabetic patients use CAM. The distribution of diabetic patients according to the type of CAM Use. Majority (40.2%) of diabetic patients use all types of CAM [Figure 1]. Results of distribution of diabetic patients according to their attitude regarding CAM, showed that the majority (66%) of diabetic patients had negative attitude regarding CAM use. 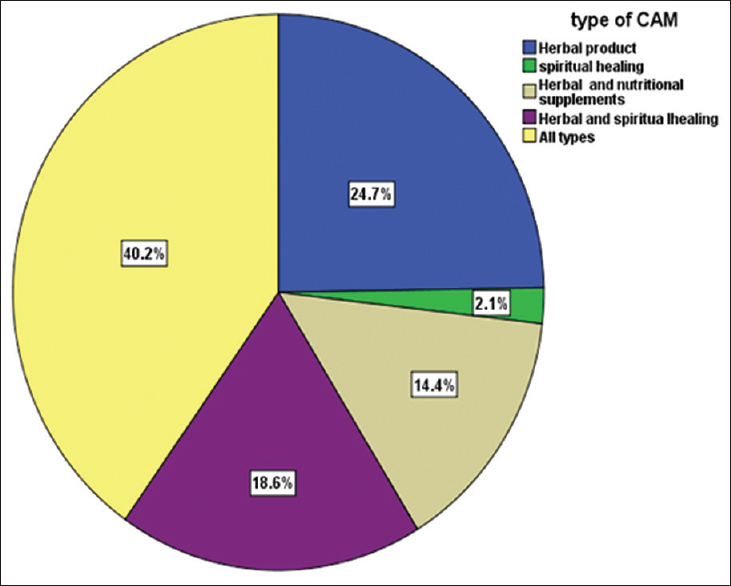 In this study, the most common types of CAM used by diabetic patients were herbal products (24.7%), and nutritional supplements- spiritual healing (18.6%). This results was in agreement with many other studies worldwide. Herbal and nutritional supplements were used together by diabetic patients at 14.4%, and the majority of patients (40.2%) use the three types of CAM modalities as shown in [Figure 1], which illustrates the distribution of diabetic patients according to the type of CAM use. Our results were in agreement to the result of study at Malaysia in which the most commonly used CAM among diabetic patients was biologically based therapy like herbal products at 50%. These results were similar to a study at Morocco and also were in agreement with the results of study at Saudi Arabia. However, in India, the most commonly using CAM modalities among diabetic patients was naturopathy (97.3%). This result was in disagreement with our results regarding the CAM modalities. In this study, the most common type of herbs used by diabetic patients were garlic (16.9%); among all types of herbal products used by diabetic patients, lemon was used at 19.1%, cinnamon (Darcin) at 10.2%, fenugreek (Helba) at 8.8%, bitter gum at 7.3%, a mixture of herbs at 18.3%, and black seed at 7.3%; so, our results are in agreement with a study at AL-Nasiriya in which cinnamon use was reported by 12.4%, black cumin by 11.1%, and garlic by 6.5%, and in our study, 18.3% of type of CAM used by diabetic patients were a mixture of herbs, and these results were in agreement with a study at AL-Nasiriya in which the most commonly used type was a mixture of herbs made by local herbalists (17%); also, our results were in agreement with a study at Malaysia in which garlic was used at 21% while bitter gourd was used by diabetic patients in Malaysia at 48.7% which disagree with our results as bitter gourd is commonly present in Asian countries such as China, Japan, India as well as Malaysia, but it was not present in Iraq. In our study, 62% of participants had good knowledge, 28% had fair knowledge, and 10% had poor knowledge about CAM. In our study, 44.3% would use CAM again, and this result is in contrast with the results of Saudi in which only 6% would use CAM again and 55.7% would not use CAM again. The distribution of the diabetic patients according to the knowledge score about CAM was about 62% of diabetic patients had good knowledge, 28% had fair knowledge, and 10% had poor Knowledge although it is impossible to compare the knowledge scores in our study with other studies (simply because of different questionnaires used). In the present study, the distribution of diabetic patients according to their attitude score regarding CAM showed that 66% of patients had negative attitude toward CAM, and this result disagrees with the Saudi study in which the majority of patients (90.7%) have positive attitude toward CAM. These results reflected the previous experience of diabetic patients with CAM use that failed in achieving the desirable glycemic control in the majority of them who used CAM previously, and most of them depended mainly on insulin or antidiabetic medications. Regarding the source of the knowledge about CAM among diabetic patients, relatives prescribed in 43.3%, friends prescribed in 29.7%, and 27% obtained knowledge from internet. These results are in agreement with the results of other studies such as Saudi study in which the source of information about CAM is mainly from friends (33.14%), relatives (32.57%), and followed by media (21.19%). Our study also agrees with a study in Morocco in which the most common source of CAM information were recommendations from friends, families, followed by media; these findings highlight the importance of patients' close environment in decision-making process and health behavior; so, health professionals should be aware of the impact of their beliefs and attitudes on the beliefs and attitudes of their patients. In our study, there is significant association between educational level and score of knowledge as patients with higher educational level had good knowledge, and this was in agreement with results of study done at India where higher levels of education and socioeconomic status were significant positive correlates of CAM use; also, our results about in this situation were consistent with results of study at Morocco as the educational level influences herbal use; also, our results are similar to the results from a study in Iraq about CAM in which the knowledge score about CAM was significantly higher in those with higher educational levels. Although there was no significant association between female gender and knowledge about CAM, there was higher percentage of females (66.1%) who had good knowledge, and this result was similar to many previous studies such as a study in Sri Lanka where use of CAMs was significantly associated with the female gender, and also, a previous study showed that older female patients with higher level of education were more likely to be CAM user, and in Malaysia, female were 1.8 times more likely than male. This could be explained by attachment of the women in our country to traditional medicine, and it may be also linked to the fact that they stay more often at home as most of them are homemakers and had more time for communication with relatives and friends. Furthermore, we found in our study a significant association between residence and knowledge score since the lifestyle factors play a role in increasing the knowledge of patients. In our study, there is significant association between family history and knowledge score. There was no significant correlation between level of knowledge and other study variables including marital status, occupation, and smoking; also, it is important to note that there was no significant correlation between clinical data about DM among participants and level of knowledge other than family history of DM, particularly between glycated, as diabetic control was confounded by other factors such as compliance as well as other treatment modalities. Moreover, in addition to that, most of the participants used CAM products irregularly that make us unable to correlate their effects on BMI, glycated HB readings, simply because our study is just a cross-sectional study, and we need cohort study to find any significant correlations between CAM use among diabetic patients and their effects on HbA1c. Regarding the association between attitude and clinical data about DM, there was significant correlation between patients' attitudes and their family history. Furthermore, this study showed that patients on regular follow-up visits had negative attitude toward CAM. In the association between attitude and sociodemographic variables, there was significant association between attitude and educational level, and also, there was significant association between the age of patients and attitude score. This study estimated that the prevalence of CAM usage among diabetic patients in Babylon province. Since there is no study in Iraq that is exactly similar to our study, we could not compare our study with other regional studies regarding the prevalence of CAM use. The most commonly used CAMs by diabetic patients were herbal products, nutritional supplements, and spiritual healing, which is consistent with other studies in many eastern and western countries. The most commonly used herbals were garlic, lemon, Helba, and Darcin, which was also consistent with other studies. This study showed that the diabetic patients had good knowledge about CAM and negative attitude which consistent with other studies worldwide. The study also showed that there were significant correlations between knowledge-attitude score and educational level of the participants, residence, age, and family history of DM. World Health Organization. Diabetes Fact Sheet N°312. World Health Organization; 26 August 2013, October 2013. Available from: https://www.who.int/news-room/fact-sheets/detail/diabetes. [Last retrieved on 2014 Mar 25]. AlRawi SN, Khidir A, Elnasha MS, Abdelrahim HA, Killawi AK, Hammoud MA, et al. Traditional Arabic & Islamic medicine: Validation and empirical assessment of a conceptual model in Qatar. BMC complementary and alternative medicine 2017;17:157. Ching SM, Zakaria ZA, Paimin F, Jalalian M. Complementary alternative medicine use among patients with type 2 diabetes mellitus in the primary care setting: A cross-sectional study in Malaysia. BMC Complement Altern Med 2013;13:148. Williams Textbook of Endocrinology. 12th ed. Philadelphia, USA: Elsevier/ Saunders; 2011. p. 1371-435.
International Diabetic Federation; 2017. Available from: https://www.idf.org/our-network/regions-members/middle-east-and-north-africa/members/36-iraq.html. [Last retrieved on 2014 Jun 22]. Chang HA, Wallis M, Tiralongo E. Use of Complementary and alternative medicine among people with Type 2 diabetes in Taiwan. A cross-sectional survey. Evidence-Based Complementary and Alternative Medicine 2011;2011:8. Al-Eidi S, Tayel S, Al-Slail F, Qureshi NA, Sohaibani I, Khalil M, et al. Knowledge, attitude and practice of patients with type 2 diabetes mellitus towards complementary and alternative medicine. J Integr Med 2016;14:187-96. Al-Asadi JN, Salih N. Herbal remedies use among diabetic patients in Nassyria, Iraq. Middle East J Family Med 2010;10:40-6. Medagama AB, Bandara R, Abeysekera RA, Imbulpitiya B, Pushpakumari T. Use of complementary and alternative medicines (CAMs) among type 2 diabetes patients in Sri Lanka: A cross sectional survey. BMC Complement Altern Med 2014;14:374. Naja F, Mousa D, Alameddine M, Shoaib H, Itani L, Mourad Y, et al. Prevalence and correlates of complementary and alternative medicine use among diabetic patients in Beirut, Lebanon: A cross-sectional study. BMC Complement Altern Med 2014;14:185. Wazaify M, Afifi FU, El-Khateeb M, Ajlouni K. Complementary and alternative medicine use among Jordanian patients with diabetes. Complement Ther Clin Pract 2011;17:71-5. Ali-Shtayeh MS, Jamous RM, Jamous RM. Complementary and alternative medicine use amongst Palestinian diabetic patients. Complement Ther Clin Pract 2012;18:16-21. Alami Z, Aynaou H, Alami B, Hdidou Y, Latrech H. Hrebal medicines used among diabetic patients in oriental Morocco. J Pharmacogn Phytother 2015;7:9-17. Al-Rowais NA. Herbal medicine in the treatment of diabetes mellitus. Saudi Med J 2002;23:1327-31. Alkhazrajy LA, Habib HA, Alsudani ZI. Perception of Iraqi primary health care providers about herbs in practice. Eur J Bot Plant Sci Phytol 2014;1:27-52.